Last month, you may have seen several excited statuses over social media from your athlete high school friends celebrating their commitments to various colleges. Some of these statuses may have even included a picture of your friend signing a letter to formalize his or her commitment. If your friend was signing a letter, he or she probably didn’t commit to an Ivy League school. Unlike other Division I NCAA schools, the eight institutions that comprise the Ivy League do not offer athletic scholarships and therefore cannot have committed recruits sign National Letters of Intent—agreements recruited athletes make with Division I and II universities to attend a full year of college in exchange for one year of athletics-based financial aid. 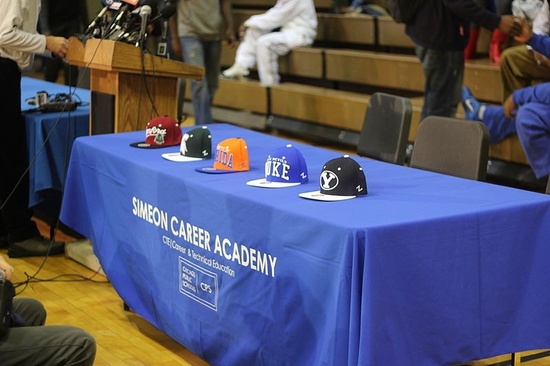 As long as the recruit completes the school’s application process, an NLI essentially guarantees admission to a college. So how was your Brown-bound or Crimson-committed friend so confident of his or her admission? Your friend probably received what is known as a likely letter. Months before colleges mail the final, fat acceptance envelops, Ancient Eight coaches provide admissions officers lists of athletes, usually committed, for whom the coaches want extra consideration. If the admissions officer gives the thumbs-up to a recruit, the athlete receives a letter from the admissions department. A likely letter is not an explicit guarantee of admission. Rather, it states that the school fully intends to admit the applicant as long as he or she continues to excel in the classroom. Recruits are not the only ones to get this prestigious postage; other exceptional applicants may also receive these letters, which are usually mailed around mid-October for the early application round. Although Ivy League universities are not bound to admit recruits in the same way as universities who offer NLIs, the Likely Letter serves a similar function as its scholarship-promising counterpart: it dissuades them from pursuing other academic options and allows them to breathe a sigh of relief.